I vaguely remember Cole (we called it Cole’s) Drug Store on Broad Street. Later, it was off Sullivan Street, next to The Little Store. It became Revco, then waved bye-bye as it decamped to Stone Drive as a CVS. 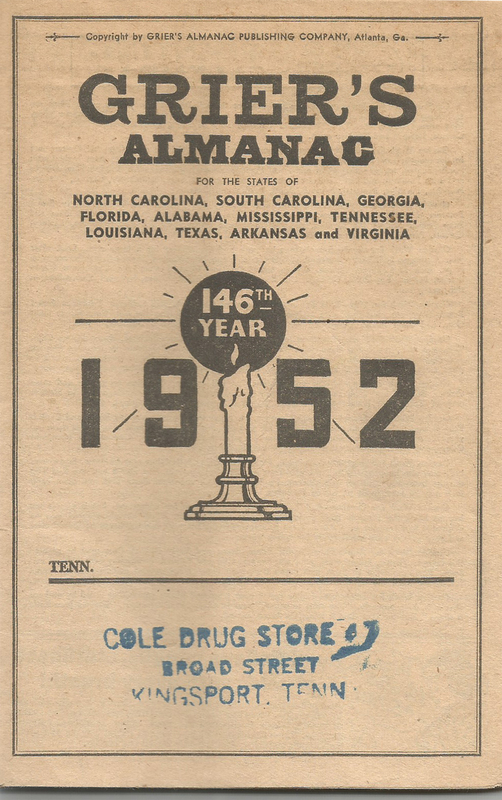 The ads in the almanac are cheerfully non-pc (“Throw Away That Truss!”) (“Eyeglasses By Mail”). Just right in your face (“Develop a He-man Voice”…buy looser underpants?). This entry was posted in Kingsport TN ephemera and tagged Cole Drug Store, CVS, Revco, The Little Store on November 23, 2015 by Bob Lawrence. Is this almanac for sale? My family owned Cole Drug Store. Send me your mailing address and I’ll send it to you, no charge. My family will appreciate this more than you can imagine. I removed the details of your address from your reply. I’m pretty big on privacy. I’ll have it in the mail tomorrow or Friday.